Darling daughter has packed up her amusing nautical wardrobe and deserted ship for her usual haunts. But she promises to guest blog soon, to provide HER perspective on the SlowBoatin' Life. For quite a lot of the time, what we do is we steer the boat. When you're traveling 3 - 4 miles per hour, it pretty much takes all day to get anywhere! There's a lot to do before we sail each day. (Evicting the spiders alone is a huge chore!) We also check the ridiculously expensive fenders to make sure they're tied securely and won't fall off and float away; bail the dinghy if it rained overnight; close up the canvas panels in the bow, so waves won't wash in; stow away or batten down anything that could fall off a shelf and break; turn the fridge to "less cold" and unplug phones and laptops, to avoid draining the house batteries. 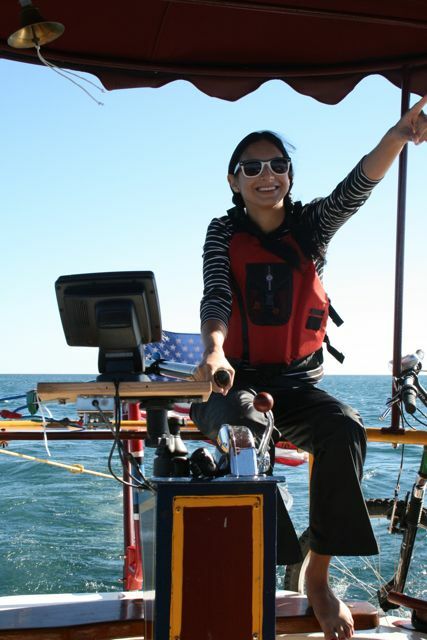 There are boat chores related to our propulsion systems: Wiping down solar panels to get rid of dead bugs and gull poop. Topping up batteries with distilled water. Les frequently, changing oil and other fluids. Pumping the bilges. the bounding main . . . It takes time to check the charts, boot up the chart plotter, put waypoints IN the chart plotter. Figure out where to stay for the night. Make a bailout plan and identify alternate ports, in case the weather turns and we can't go as far as planned. Put on life jackets and sunscreen; put coffee and binoculars within reach. Casting off takes time: hauling the anchor, or casting off lines from a dock and working through the maze of a marina; avoiding million-dollar yachts and clueless fishermen in dinghies. Then we're underway. On calm days, the person who's not steering can read, fish, work on a laptop, do other boat chores, or (if you're DD) lie on the sliver of roof NOT covered with solar panels and get a tan while studying your law books. First mate likes to cook ahead for dinner while underway because there's wind to blow away the heat of the stove; she also scopes for amusing photo ops for the blog and researches sustainability projects we might go see in the next port. Cap'n likes to read diesel repair manuals and wiring charts. The crew member who is not steering can do these things if it's calm, but it's rarely calm. If the boat is bouncing, it's hard to do anything inside. Furthermore, if the navigation is complicated, if the waves are high, or if there's lots of boat traffic, it's helpful to have two sets of eyes on deck. Locks take two people to negotiate; it can take 15 - 45 mins to negotiate a lock; we've had days where we passed through up to six locks. And sometimes you just WANT to be on deck even if you are not at the helm because there are interesting sights all around! Finally, if it's foggy, boats are supposed to sound a horn every two minutes. When we're running off stored solar power, we try not to use our electronic boat horn, because that would drain the starter battery. Instead, we have a fail-safe "alternative-energy alert system" that uses no fossil fuels whatsoever and releases no harmful emissions: Cap'n blows his conch. 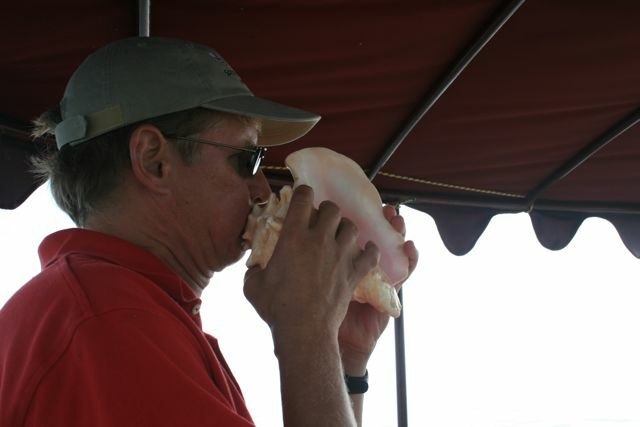 Note to self for future reference, check with VSC Committee to find out if a conch will pass as a sound producing device for a Vessel Safety Check... I see no reason why it wouldn't! I could start recommending that kayakers or maybe PWC riders carry one! And here I thought Mel was kidding . . . but check out the link! Cap'n, you'll be able to retire your swiffer!